Welcome to Speedrun Sunday: that sadistic time of the week when we dare to challenge both your D-pad’s durability and sanity’s stamina with the ultimate test in video game bragging rights. Hot off the culinary kicks of our Battle Chef Brigade challenge comes yet another ruthless run that’ll leave you tearing out your nuts and bolts. 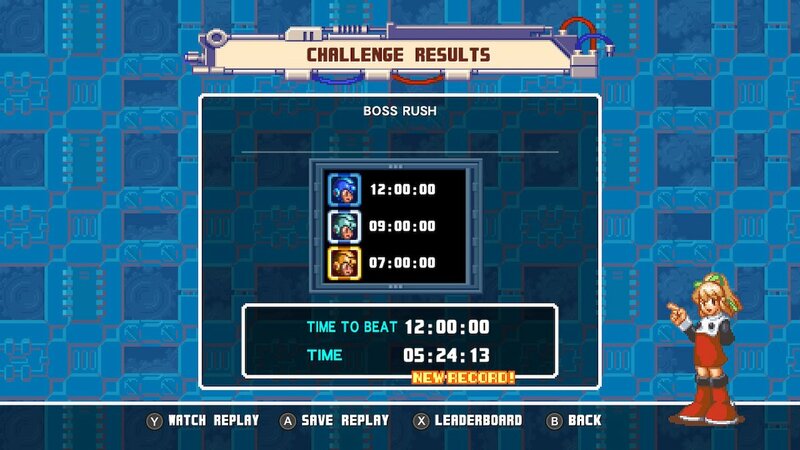 That’s right, fans of Mega shots and wily robots: We’re beaming in for a second round of Reploid retribution in Mega Man Legacy Collection 2.
Who can get the fastest time blasting through challenge stage MM7 Boss Rush? Our claim to fame is 05:24:13, which shouldn’t be too hard for the more battle-hardened of bots among you. The mega maniac with the fastest time by 12:00 a.m. PT will win a $10 eShop card (North America), along with the illustrious title Most Bodacious Blue Bomber. All submissions must be made using the Switch’s 30 second video capture feature ending with the challenge results screen (as shown below). No leaderboard snapshots or replay videos will be admissible. All runs must be made fresh. Make sure your in-game alias in the leaderboards either matches or closely resembles your Twitter handle so we know it was you. In the instance of a tie, we’ll settle things in Smash live later during the week using various level 50 amiibo representing the winners. Feel free to improve upon and submit new scores as many times as you like. Follow @NinWire and @tater_n_tots on Twitter and retweet this post to qualify for today’s cash prize. After that, simply share your video in the Twitter comments and we’ll personally send both your winnings and a social media shoutout within the week. We’ll be keeping score right here in the article all day, too, so you can easily keep track where your top rivals rank. Also, feel free to tune in to our Mega Man Legacy Collection 2 livestream at 5:00 p.m. PT where I’ll personally be contending alongside today’s top competitors for fame and glory.